Antioch on the Orontes (Greek: Αντιόχεια η επί Ορόντου; Latin: Antiochia ad Orontem) was one of the most important cities of the Graeco-roman period. The ancient city stood on the eastern side of the Orontes River. It is currently partly covered by the modern city of Antakya. It was founded in the 4th century BC by Seleucus I Nicator. Antioch eventually rivaled Alexandria as the chief city of the Near East and played a particularly strong role in the late Empire. This water source seems to have varied names. There also may be different versions of where it is located. For us the site is near the Beroea Gate, in fact just within it. "For after the battle at Issus and the flight of Darius, Alexander, who possessed part of Asia, but desired the rest of it, since he thought little of what he had already won, but instead looked toward the ends of the earth, came to this region, and pitched his tent near the spring which now, through his work, has the form of a shrine, though its only adornment then was its water; and refreshing his body there after his toils he drank the cold clear sweet water of the spring. The sweetness of the drink reminded Alexander of his mother's breast; and he said to his companions that everything that was in his mother's breast was in the water too; and he gave his mother's name to the spring.....Alexander however did not put our spring into a contest with other waters, but declared it equal to the milk of Olympias. So great was the pleasure which he found in these streams. Wherefore he at once adorned the spot with a fountain and with such of the other appropriate details as were possible on such a campaign, which he was conducting in the swiftest possible manner; and he began to build a city, since he had found a spot which was capable of giving scope to his own magnificence." This commentary is regarded as fanciful in some commentaries, notably Norman, as being a tenuous attempt by the Antiochenes to link the city's foundation back to Alexander, even though the city was founded decades after his death. In our commentary on the Vicus Agrippae, mention is made of the quarter built, and named for, Marcus Agrippa which was built outside the Beroea Gate. There were also baths built by him on a lush site with a spring on the slopes of Mt Silpius. This might have been realted to the famed spring. The traveller, Tinco Martinus Lycklama, in 1866 records of the spring: "Nous nous reposâmes une demi-heure auprès de la belle fontaine que les Arabes appellent Aïn-el-Taouil (la Longue) et qui se trouve en dehors de la porte ombragée par un platane gigantesque sous lequel un cafetier turc s'est établi, dans un enfoncement occupé jadis par le gardien de cette entrée". "Une source d'eau pure, ombragée par trois grands platanes, embellit le voisinage de la porte de Saint-Paul. Un Turc s'est établi là , offrant aux passans et aux oisifs le café et la pipe. Ainsi placé au bord du chemin d'Antioche et d'Alep, à côté d'une fontaine et eous de frais ombrages, le cafetier de Bab-Boulos ne perd point ses journées ; des musulmans désœuvrés vont chaque jour jouer aux dames ou aux échecs sous les grands platanes. La fontaine voisine de la porte de Saint-Paul est mentionnée dans la chronique de Guillaume de Tyr." 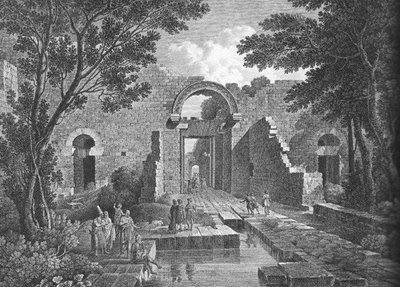 Below can be seen Cassas's bucolic view of the inside of the Beroea Gate and the pool of the spring that Lycklama refers to. "Eundem hunc fontem esse crediderim, qui nomine S. Pauli ab historicis cruciatarum expeditionum et recentioribus celebratur, in urbis parte orientali maxime insignis". "Willermus I, 10. IV, 13. 14. M. Sanuti III, 5, 4 Monkonys apud Dapper. 1.1. La Roque p. 202., qui huic stagno longitudinem CG, latitudinem C pedum tribuit. Niebuhr T. III. p. 16. Ex hoc aliisque fontibus Orientalis partis palus rigabatur, cui ad portam Canis pons lapideus, egregio opere factus, superstructus erat". Thus the spring's run-off was probably the cause of the swamp that formed in the bed of the silted up arm of the river, which bedevilled the beseiging Crusaders. We note that much of the commentary on the water sources of Antioch refer to the aqueducts fed by the springs at Daphne. No mention is made that water may have been sourced from the north of the city where this spring lay. According to one of our modern day sources the spring at the Beroea Gate still exists and feeds the city water supply. We can't see why it shouldn''t have, at least in part, back in ancient times served a similar purpose, if only for the residential areas and baths in the immediate vicinity.